It's the most wonderful time of the year and so I had the fun idea to blog about easy ways to make Christmas a little more special. I love to decorate my house even though I had to tone it way down since we got our cat Leonie. She has successfully prevented us from using my glass ornaments for the past 3 holiday seasons. We can no longer have lights on our tree because Leonie will chew up all the cords. And one of the silver pine cones you see in my photo below ended up as a kitty-present in my purse one morning where I found it hours later when I was in line at Market Basket. It's not easy but I carry on haha. And now here is the first edition of our series of Christmas ideas, brought to you by Fintan and Sybille. Enjoy! I saw these orange and glove creations years ago in a magazine and was immediately delighted! First of all the scent is fabulous, and these are actually easy and cheap to make. I like that you can match the ribbons to your color scheme as well. The only minor drawback is that they don't stay fresh longer than about 2 weeks. After that they look like an aging Hollywood diva after drinking too many cocktails. So you can either replace them with fresh ones or make them when it gets closer to Christmas. You need: Nice plump oranges, whole gloves, a needle, little pins (optional), festive ribbons (AC Moore or Michaels have huge selections). 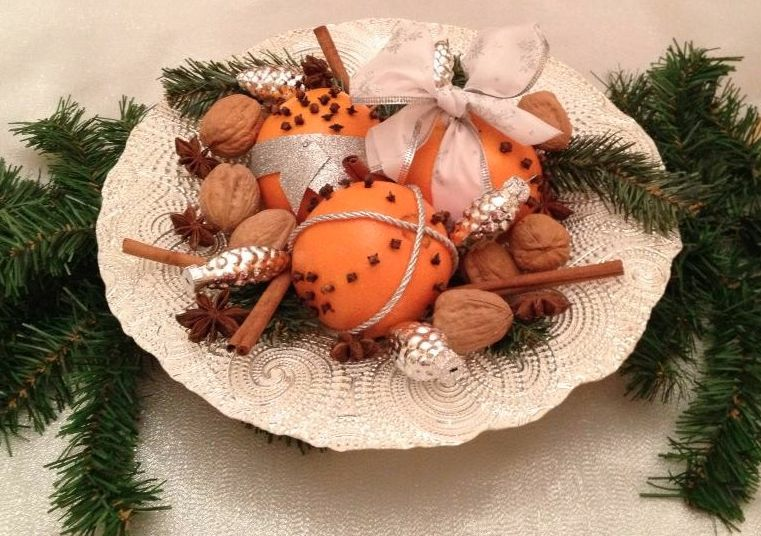 If you want to present them on a plate or small platter, walnuts, star anise, cinnamon sticks, greenery and a few little ornaments all compliment your Victorian Pomanders beautifully. They also looks really pretty on purple or blue velvet. Start by tying your ribbons around the oranges. I came up with a little trick of using tiny pins to securely hold the ribbons in place. Next, continue by pushing the glove stems into the oranges in all sorts of different patterns. It's easier on your fingertips if you prick the orange skin with a needle first, then insert the glove. Always do this as a second step because the placement of the gloves is easier when you already have the ribbons in place. Guess what, now you're done! Yes, DONE! Arrange them any way you like on your holiday table and enjoy the delicious scent of oranges and gloves!